Well folks, it's that time of the week. #ResultsSzn is officially in gear. We've got YUUUGE results on the docket for ya. 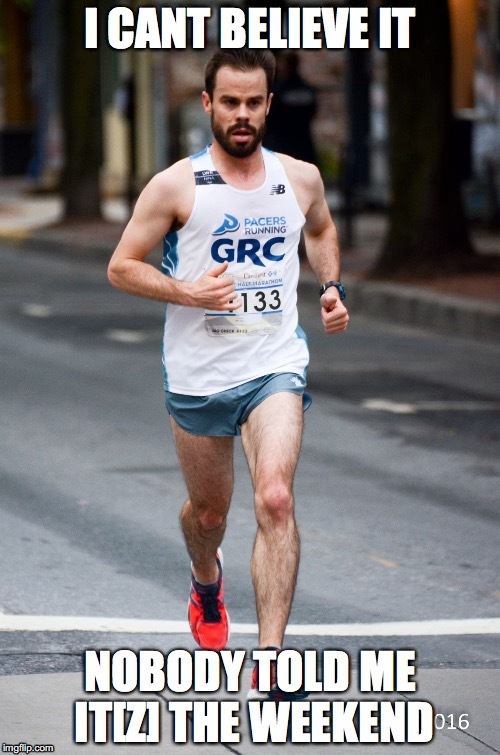 First up is Lucas Stalnaker for his raucous showing at the Philly Half in a time of 1:05:26, good for #3 on the GRC all time list. We haven't seen a debut like this since the szn premier of Lost folks. And while young Lucas was not involved in a plane crash symbolizing the soul's dance between life and death, he was able to bring home 6th place honors and the covefe GRC Athlete of the Week. Jerry noted that weather was less than ideal with the sudden onslaught of climate change and all, but Lucas ran strong and he ran smart with a bright future surely ahead. Sticking with the Philly Half, Maura L. made her szn debut in 1:20:09, followed closely by Kerry Allen in 1:20:53. 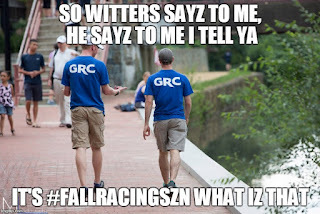 The two had strong showings with a solid #fallracingszn ahead. In addition, Sean B. ran all the way to a 1:12:21. The humidity this year was as bad as years past. Thanks Obama. 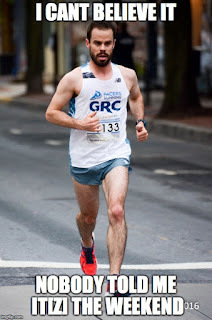 Closer to home, GRC harriers saw strong performances in the Navy Half and Navy 5 Miler. Kieran took home the win [what's new] in a solid 1:09:41. Ryan Spier made his halfszn debut in 1:09:50. While he may be the less-handsome Ryan, he surely raced his way into our hearts. 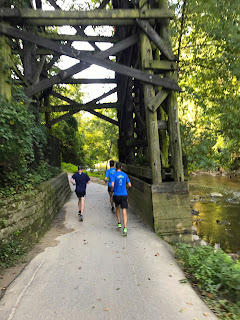 Graham galloped to a 1:12:21, followed by TKIV [Tom], Tyler, and Fridge, in 1:14:29, 1:15:03, and 1:18:43, respectively. On the women's side, we saw inspirational performances from Hallie Fox in 1:25:42, Keely in 1:26:31, and Teal, in her first race since the Olympic Trials [sweet brag Teal] with a 1:26:31. Hallie made her debut to the tune of whoaaa, while Keely continues to mash and Teal rounds back into shape after introducing new life to the world [sweet brag again Teal]. In the Navy 5, Stew [24:50] and Steph [29:43] brought home wins to make it a Reich sweep. There hasn't been a Reich sweep since...well... since the last one. GRC took home the #3, #4, and #6 spots from Mark [26:12], Luk [26:27], and Chris [plain Jane 27:10]. It should be noted that times were slow across the board due to the race coming in contact with stragglers from the half [thanks Obama]. You know what I say though, Darwin has a theory that. The end of this week's results culminate in lifetime runner and friend Dickson, who raced at the 1st annual Henry Mercer Monmouth XC Invitational. It's not everyday you get to run a race named after your father, and for your first born son. So, good on ya Dickson. You know what they say folks, nature vs nurture. Nature always wins. Keep that boy running Dix. 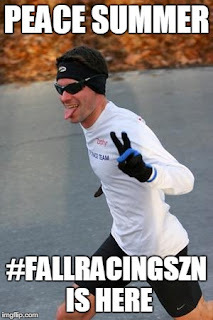 There is no more certain sign that #fallracingszn is upon us than GRC marathoners cranking out the hard training. 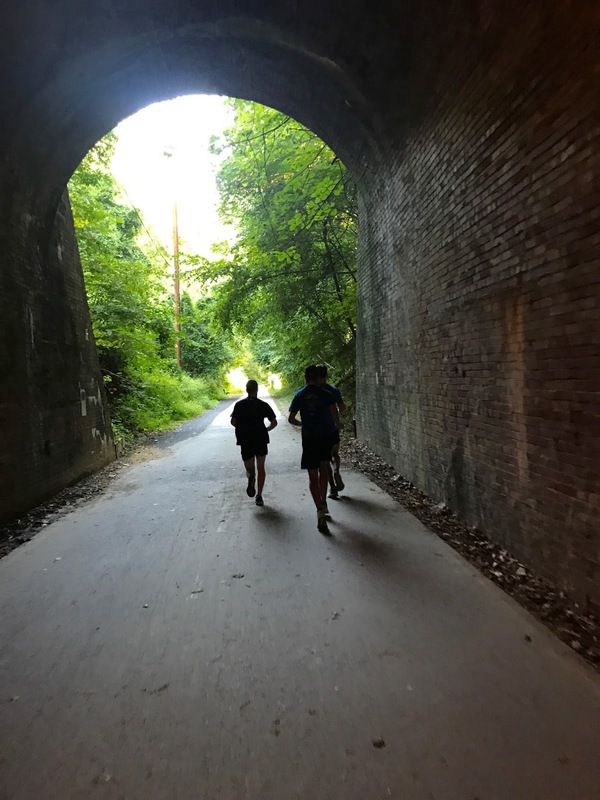 What I present in this post is pictorial evidence of an oft-overlooked aspect of marathon training: namely, running under immense objects. Be sure to add at least 2x running under large objects (as demonstrated above) to take things to 11 this marathon season. 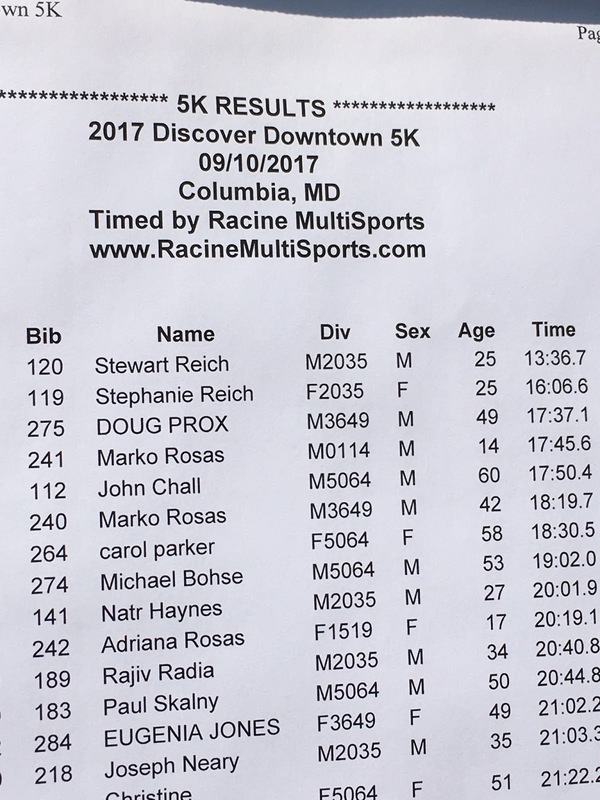 If the results are to be believed, Stewart Reich has supposedly broken 14 minutes for 5k at this morning's Discover Downtown 5k in Columbia, MD. His reported time of 13:36 is a PR by 54 seconds. Excuse me for editorializing here, but I think this is bull crap and I suspect foul play. Exhibit A: Stephanie and Stewart raced and won the Market Street Mile yesterday in 5:01 and 4:16 respectively. 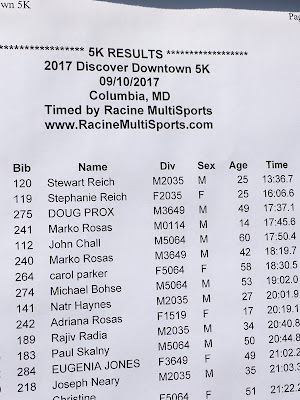 I don't care if you're a Reich, running two races in a weekend is not conducive for a PR, let alone one of this magnitude. Exhibit B: We all know that Patrick Murphy has continued to spend a good amount of time in the DC area since "moving" to Boston, and followers of this very blog may recall that "Murph" attempted to doctor the results of the Fathers' Day 8k, but seemingly got cold feet at the last minute. If anyone has photographic evidence of Patrick in Columbia this morning, please post on our Facebook page. Let me be clear - I don't necessarily think Steph is implicated in all of this, but the question remains: what did she know and when did she know it? You can smell it, I can smell it, and we're all getting the feels for the #fallracingszn. Gone is the hard training of summer. The sun is officially relegated to a #beta with its shorter days and questionable temperature. And #PSLs are back in a big way. A witty man once said "Legends are born in July, but they're remembered in September". We've got big races on the docket folks, but first make sure to be a hero and volunteer for Pacer's waterstops and DCXC. Get. @. Sean O. This weekend, budding superstar Gina McNamara makes her low-key debut in the Parks Half [marathon]. Speaking of the half, Sean and multi-Boston harrier Chris Bain will be looking to open #fallracingszn in a big way. Look for Bain to keep it steady and strong, unlike that snowflake, the Sun. And sources say Sean plans to "put one foot in front of the other" and see how it shakes out. Bold strategy, bolder mindset but they don't call him the peoples' runner for nothin'. The Reich duo [Stew & Steph], taking the summer harvest to the Market [Street Mile] Saturday and a low-key 5k in Columbia on Sunday. The mile sets up well for the couple; fast pace and even faster post-race boomerang instastories. 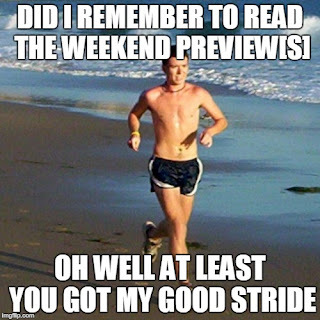 Be sure to mash that refresh button Saturday and Sunday. Finally, Kyle W will be snowshoeing back home in Canada, well as close as you can get without technically being in Canada. 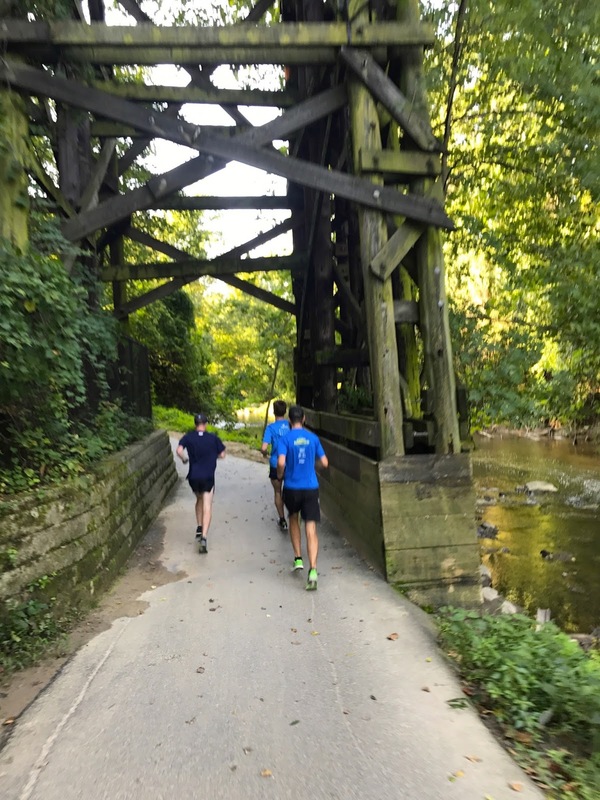 He'll be prepping for harsh winter-like conditions at his college alumni race somewhere near a lake. But you know what they say about the weather in Minnesota folks? If you don't like it, wait 5 min. That's it for now. 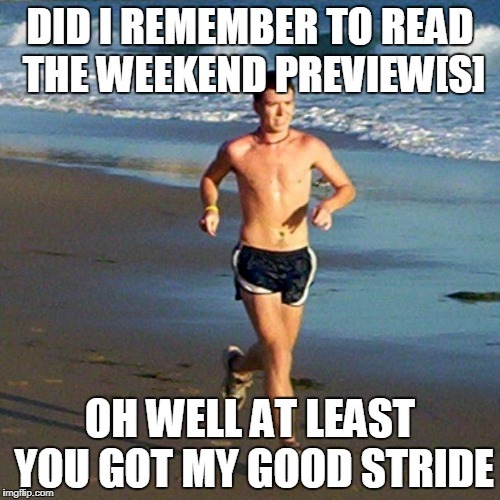 Be on the lookout for more weekend previews later this month. Hammer it here for updates and results.